I stopped writing reviews for almost 3 years now but I'd like to share this one so other travellers will be aware. This hotel has good location as it is close to everything you need. Breakfast is also good with a garden view and the swimming pool. Room is too little (12 sqm) even we book a premium with balcony and facing the garden and pool. The downside, we booked an airport transfer a day advance but no taxi arrived at 5:00AM as scheduled while this reservation has been confirmed 2x by two receptionists (morning and night duty). Therefore, arrived late at the airport and the last passenger to enter the plane. The merchant wrote me to return the payment for the taxi and with apologies. Sounds insincere, so instead we decided to tip the refund to 2 staffs that deserve to be noticed with impeccable service (Mr. Luckly Lumberto the only staff on duty at 5:00AM that phoned a taxi for us & the other guy that cooks breakfast everyday). Also on our first night we seek assistance to the property manager with regards to the incident we had from the other establishment outside this hotel and it's just within the vicinity. He said he knew the owner of that establishment and he will talk to the owner and relay the incident. He advised me also to keep the receipt as proof of payment to settle the things. Since then and every time i passed by the lobby for 5days/4nights, he's pretending busy and didn't see my presence. Will not stay here again. Late Birds was excellent start to finish - easy check-in, comfortable and clean accommodations, delicious breakfast, and nice common areas to enjoy with other guests. And the location is great, walkable to the sights but located on a quieter street. Highly recommended! Great Location, friendly and helpful staff, delicious breakfast till 12. The quiet garden will the pool in the middle of the busy quarter is a real suprise. Always someone there, to say hello. Feels like coming home. will definitely stay there again. From the minute we walked in and were greeted by the entire friendly staff who took our bags up to our room and ushered us into the house concert that was just starting — by the incredible band “Fado Bicha” — I felt at home here. This place is like a secret, townhouse that doubles as your second home/ favorite hangout while you are staying in stunning Lisbon. And the (included) breakfast in the morning was probably the best hotel breakfast I’ve ever had anywhere. We loved it and I will absolutely go back! I stayed at this beautiful hotel for 3 nights this week. The hotel is located in a great area for exploring lisbon the 28 tram stop is minutes away and the Chiado metro station is a 7 or 8 minute walk. Plenty of nice bars and restaurants near by and a 5 minute walk from one of the best views of the city and bridge. The rooms are very nice with really comfortable beds and include iMac pcs and the showers are very powerful. The garden is a tranquil place to relax after a long day exploring Lisbon. The breakfast is superb and I looked forward to it every morning delicious assortment of food and great home baked cake every day especially the banana cake was scrumptious. The staff were very friendly and approachable Overall a fantastic place to stay and I would definitely recommend this hotel if you are visiting Lisbon. Absolutely loved my stay at the Late Birds. Antonio went above and beyond to help me with my site seeing. The rooms are beautiful & spotless, breakfast was great. All in all a most beautiful place on a quite block with no traffic. Very well kept Hotel, peaceful, with friendly helpful staff. Rooms are comfortable to a high standard and bathroom excellent. Shower is powerful. Being down a side street it was not noisy. Hotel is well laid out with lounges and bar is required. Breakfast is served all morning. The Late Birds is a stunning boutique style hotel. Carlos, Diogo and their team are incredibly friendly and helpful. The rooms are tasteful and well appointed. The breakfast is excellent and the scrambled eggs with cheese and ham were the best I've ever had. We'll certainly stay here again on our return to Lisbon. Highly recommended. Good Location, not far to bars and restaurants with gay background. Nice city hotel wonderful building, great interiors, friendly staff, always attentive and trying to help to discover the city. Very nice gem. The Late Birds Lisbon - Gay Urban Resort places you in Bairro Alto, within a leisurely stroll of popular sights such as Santa Justa Elevator and Lisbon City Hall. This 16-room, 4-star guesthouse welcomes guests with free breakfast, an outdoor pool, and free in-room WiFi. Free buffet breakfast is offered each morning. Order from room service to satisfy your hunger without leaving your room, or make new friends over drinks at the bar/lounge. A flat-screen TV comes with cable channels, and guests can stay connected with free WiFi. Other standard amenities include free bottled water, a safe, and a desk. Guests of The Late Birds Lisbon - Gay Urban Resort enjoy features like an outdoor pool, free WiFi in public areas, and a library. Valet parking is available for EUR 13 per night. Multilingual staff at the front desk are standing by 24/7 to help with dry cleaning/laundry, tours or tickets, and luggage storage. Additional amenities include a terrace, wedding services, and a garden. 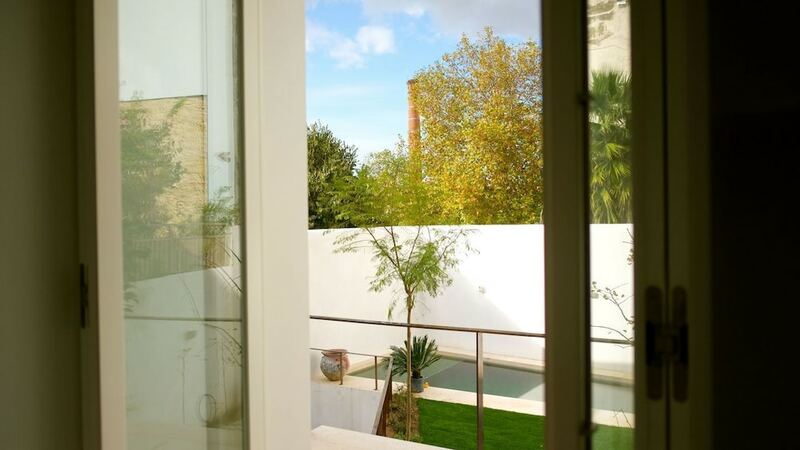 Recreation features at The Late Birds Lisbon - Gay Urban Resort include an outdoor pool. The preferred airport is Lisbon (LIS-Humberto Delgado). This property caters to men only. The guesthouse can refuse certain bookings for the purpose of group events or parties, which include pre-wedding stag/bachelor and hen/bachelorette parties.